The third day of ISMAR ’08, the world’s best augmented reality event, is unfolding with what we expect to be an eye popping keynote (pun intended) by Rolf R. Hainich, author of The End of Hardware. A question on everyone’s mind is: Why Christmas ball and not a Crystal ball? 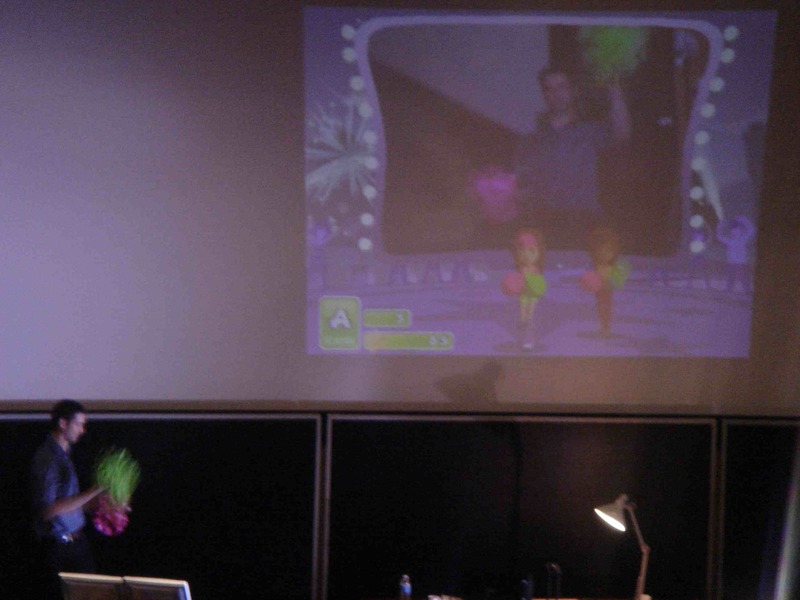 Rolf jumps on stage and starts with a quick answer: Christmas balls can help produce concave mirrors – useful for near eye displays. First near eye display was created in 1968 by Ivan Sutherland; in 1993 an HMD for out of cockpit view was built in a Tornado simulator. In 2008, we see multiple products such as NVIS, Zeiss HOE glasses, Lumus, Microvision, but Rolf doesn’t consider them as true products for consumers. 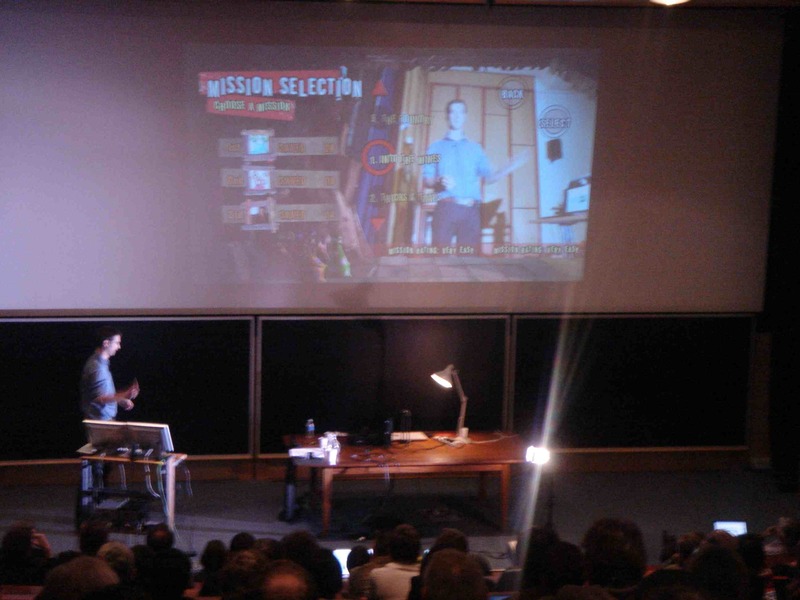 He then presents several visions of the future of human machine interaction which he dubs 3D operating system.Then he briefly touches on the importance of sound, economy and ecology – and how near eye displays could save so much hardware, power, and help protect the environment. But it requires significant investment. This investment will come from home and office applications (because of economies of scale- other markets such as military, medical, etc – will remain niche markets. Microvision website is promoting such a concept (not a product), mostly to get the attention of phone manufacturers, according to Rolf. Rolf, then tackles mask displays, a thorny issue for AR engineers and suggests it can achieve greater results than you would expect. Eye Tracking is necessary to adjust the display based on where the eye is pointing. It’s once thing that AR didn’t inherit from VR. But help could come from a different disciplines – computer mouse which have become pretty good at tracking motion. Other considerations such as Aperture, focus adjustment (should be mechanical), eye controller, are all solvable in Rolf’s book. Squint and Touch – we usually look where we want to touch, so by following the eye we could simplify the user interface significantly. Confused? 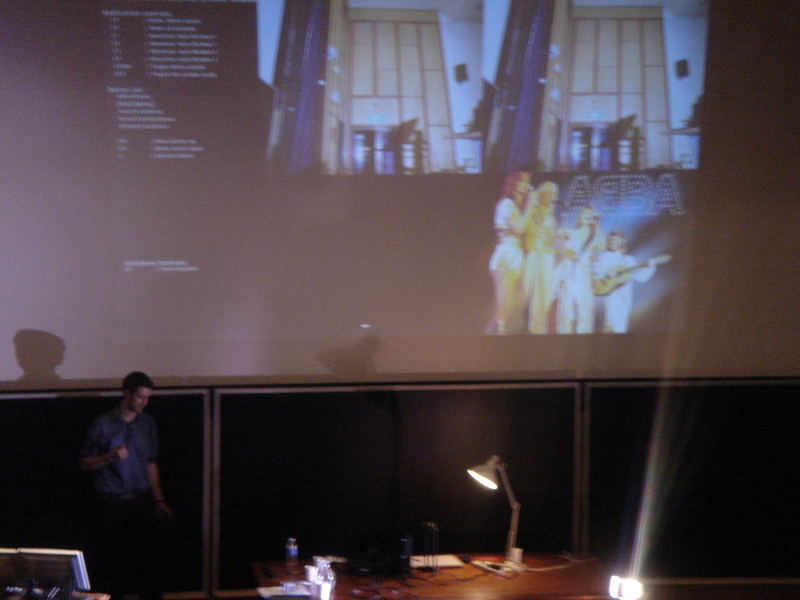 Rolf is just getting started and dives effortlessly into lasers, describing what exists and what needs to be done. It should be pretty simple to use. And if it’s not enough, holographic displays could do the job. Rolf has the formulas. It’s just a matter of building it. he now takes a step back and looking at the social impact of this new technology: when everybody “wears” anybody can be observed. The big brother raises its ugly head. Privacy is undermined, Copyright issues get out of control. But…resistance is futile. Rolf wraps up with a quick rewind and fast forward describing the technology ages: PC emerged in the 80’s, AR in the 2020’s, and chip implants (Matrix style) will rule in the 2050. Rolf: it’s the end of the conventional hardware – we will still have hardware but it could be 1000 times lighter. Rolf: People wear glasses even for the disco – it’s a matter of fashion and of making it light – with the right functionality. We first have a look at the development of AR in the recent 15 years and its current state. Given recent advances in computing and micro system technologies, it is hardly conceivable why AR technology should not finally be entering into mass market applications, the only way to amortize the development of such a complex technology. Nevertheless, achieving a ‘critical mass’ of working detail solutions for a complete product will still be a paramount effort, especially concerning hardware. Addressing this central issue, the current status of hardware technologies is reviewed, including micro systems, micro mechanics and special optics, the requirements and components needed for a complete system, and possible solutions providing successful applications that could catalyze the evolution towards full fledged, imperceptible, private near eye display and sensorial interface systems, allowing for the everyday use of virtual objects and devices greatly exceeding the capabilities of any physical archetypes. Caffeine levels are set after the well deserved coffee break, and we are back to discuss AR layouts. Onstage Steven Feiner introducing the speakers of this session. First presenter is Nate Hagbi which is touching on an unusual topic that often is seen as a given: In-Place Augmented Reality: A new way for storing and distributing augmented reality content. In the past AR was used mostly by “AR Experts”. The main limiation for spearing it was mostly hardware related. We have come a long way since and AR can be done nowadays on a cell phone. Existing encoding methods such as Artag, Artoolkit, Studierstube, MXRtoolkit as not human readable and require to store additional information in a back-end database. 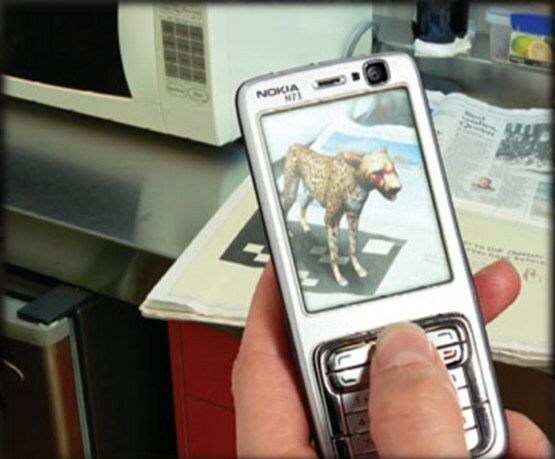 Take the example of AR advertising for the Willington Zoo tried by Satchi and Satchi (2007). In place Augmented reality is a vision based method for extracting content all encapsulated in the image itself. The process includes: Using our visual language to encode the content in the image. The visualization is done as in a normal AR application. The secret sauce of this method is the visual language used to encoding the AR information. There are multiple benefits to this approach: the content is human readable and it avoids the need for an AR database, and for any user maintenance of the system. This approach also works with no network communication. A disadvantage is that there is a limit of the amount of info which can be encoded in an image. 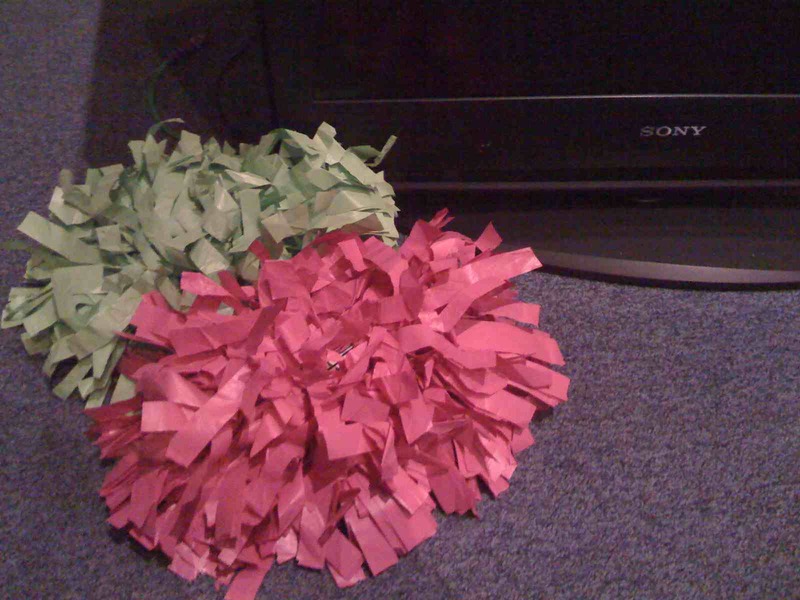 Nate describes this as a trade off. I am also asking myself, as a distributor of AR applications, what if I want to change AR data on the fly? Nate suggests that in such a case a hybrid approach could be used: some of the info is extracted from the encoded image. Additional image coding could point to dynamic material from the network (e.g. updated weather or episodic content). The idea in short is to place virtual information on the AR screen in a way that always maintains a viewable contrast. Question: Is in it annoying for users that the images on screen constantly change position…? Last in this session is Stephen Peterson from Linkoping University with a talk about Label Segregation by Remapping Stereoscopic Depth in Far-Field Augmented Reality. The domain: Air Traffic control. A profession that requires to maintain multiple sources of information and combine them into a single context cognitively. The main challenge is labeling: how do you avoid clutter of labels that could quickly confuse the Air traffic controller? The conclusion: Remapping stereoscopic depth of overlapping labels in far field AR improves the performance. In other words – when you need to display numerous labels on a screen that might overlap with each other – use the depth of the view and display the labels in different 3d layers. Everyone is back from lunch and the afternoon session is on: User studies in augmented reality. The result demonstrates complex trade-off between AR and desktop visualizations. 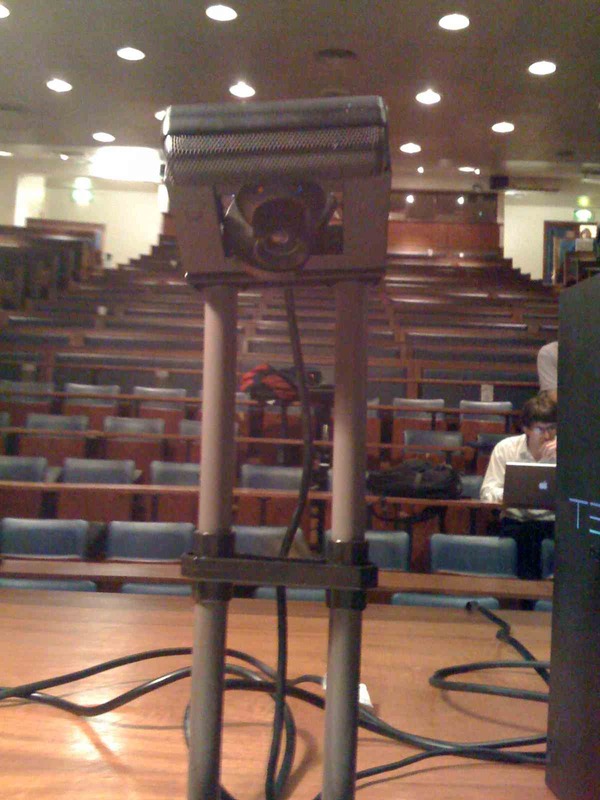 AR system provided increased accuracy in locating specific points in the scene. AR visualization was quite simple, beating the desktop in tracking and in better visualization. Stay tuned for the demo (which was hauled all the way from Australia to Cambridge)! Next on stage is Cindy Robertson from Georgia Tech (Honorable mention in ISMAR 2007) and she discusses An Evaluation of Graphical Context in Registered AR, Non-Registered AR, and Heads-Up Displays. How are users affected when there are many registration errors or in other words when when tracking is not perfect? Can the user handle it better if a graphics context is provided? They tested it with a set of tasks encompassing placing virtual Lego blocks with groups using Registered AR, Non-Registered AR, and Heads-Up Displays. Final conclusion: Registered outperformed both the non-registered AR and graphics displayed on a HUD. Non-registered AR does not offer any significant improvement. Future plans are to test home-like scenarios and impose more complex tasks. On stage Mark Livingston is getting ready to talk about The Effect of Registration Error on Tracking Distant Augmented Objects. For this study, they used the nVisorST. 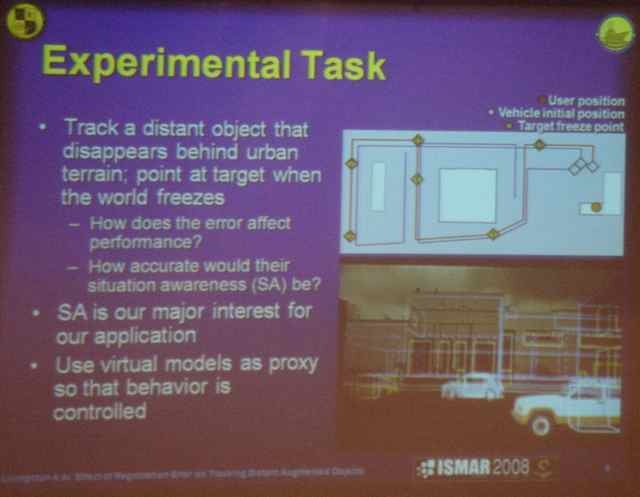 The tasks were trying to measure the users ability to understand behaviors and situational awareness in the AR application: following a target (car) when buildings stand in between. Latency has significant effect on performance and response time – was the worse. Weather had significant impact on results: darker weather delivered improved performances. Brightness was a major distraction. Welcome back to ISMAR ’08; This is the second day and we are getting to the meaty topics. Ozan Cakmakci is on stage and kicks off with walking through his paper: Optical free form surfaces in Off-Axis Head-Worn Display Design. Ozan zooms through a quick history of optics and switches to a set of graphs and functions which you can review in his paper. The conclusion is pretty clear though: Free form surfaces are useful in optical design to maximize performance in pupil size or field of view. 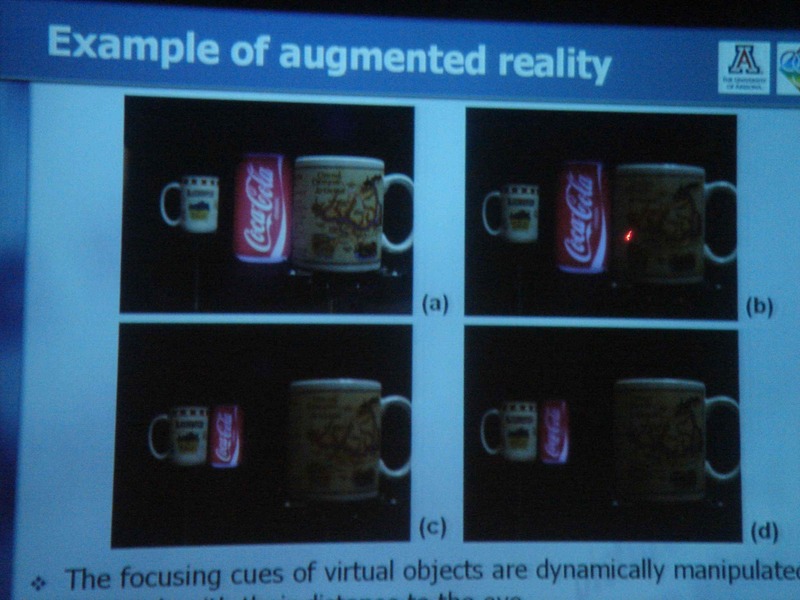 Sheng talks about the stress on the eye in an AR situation where the eye has to accommodate real and virtual object and adjust the focus accordingly, and could cause headache to the viewer. The solution is a variable-focal plane in a liquid lens. Subjective tests result in a pretty good response from the participants. With the vari-focal plane in liquid lens, the human eye can accommodate change in focus from infinity to near focus and can be used for AR applications. This would even be improved in the future with upcoming improvements in liquid lens. One of the members of the audience asks why not do this in software vs. hardware? Wouldn’t it be less expensive? – Sheng claims the results are more accurate with the hardware approach. To learn more about this, check out their website, the paper [link will be posted here], or contact sliu[at]optics.arizona.edu. 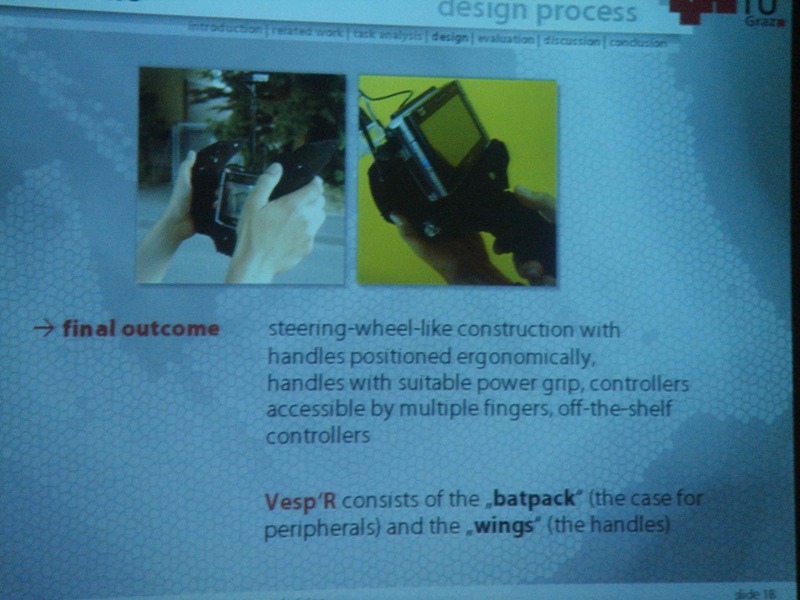 In the third leg of the “Displays” session Ernst Kruijff will speak about Vesp’R: design and evaluation of a handheld AR device. Ernst will present an alternative design. The motivation for the research and the resulting paper was the lack of published knowledge on this topic. The team looked at a wide range of AR apps (such as Vidente an AR app for field workers) on different platforms and observed the common needs. The need is simple: a lightweight device, with options for more controls, for long duration of use – indoors and outdoors. UMPCs such as Vaio could are pretty heavy and become very tiring, especially when you hold it high. A solid case; velvety grip; controls are built into handles. When comparing with existing devices -some aspects were better and others not. The conclusion is that although Vesp’R doubles the weight of a usual UMPC, it still provides improved ergonomics. But there is room for more research and improvements in this domain. A member of the audience dares to ask: what if you used a much lighter device (such as a cell phone), would the results still be the same…? Stay tuned for the outdoor demo on Wednesday!